Negative impact of the rehabilitation projects on the protection of the traditional urban tissue of the historic centre. March 2001: ICOMOS monitoring mission; April 2003: UNESCO/ICOMOS expert mission; May 2005: Joint World Heritage Centre/ICOMOS reactive monitoring mission. Experts from professional cultural and urban planning institutions have conducted an evaluation of the property and surrounding areas in response to the concerns. 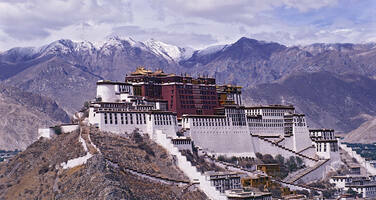 The three elements of the property – Potala Palace, Norbulingka and Jokhang Temple enjoy protection at the highest level. The government also protects the buffer zones and significant numbers of individual historic buildings. There has been a recent investment of RMB 470 million (USD 77.69 million) in conservation, management and infrastructure projects in the property. In July 2013, Lhasa city adopted the Regulation on Preservation of the Old Town of Lhasa (Appendix 2 of the Report), and has launched the Old Town Protection Project to address problems of: infrastructure; excessive commercialization with uncontrolled spread of street vendors; inappropriate post-1950s construction; inadequate tourist facility provision. The project is revising conservation plans for the Barkhor Area and Jokhang Temple. Lhasa city engages with stakeholders through questionnaires, meetings and participatory projects. In order to provide alternative venues for the 3031 street vendors, as well as improved visitor facilities, the Barkhor Mall is being constructed, and the Shenli Mall is planned; they lie outside the Barkhor Historic Area and at the edge of the buffer zone of the Jokhang Temple. The two Malls have a height of 16 and 14 metres respectively, exceeding the height control requirement of 12m in the Jokhang Temple buffer zone. The Shenli Mall is planned in a modern style, while the Barkhor Mall is traditional Tibetan architecture. It is reported that an assessment concluded that the new structures do have an impact to some extent on the surrounding historic area, but the impact on the overall landscape at the Jokhang Temple and the visual corridor between Potala Palace, Norbulingka and Jokhang Temple is slight. It is considered that the Outstanding Universal Value of the property including authenticity and integrity is unaffected. The State Party intends to strengthen protection by completing and implementing the Conservation Master Plan and revising the existing conservation plans for Barkhor Area in Lhasa and Jokhang Temple. No details of the construction of the two large shopping malls appear to have been provided to the World Heritage Centre for comment before construction commenced, in non-compliance with paragraph 172 of the Operational Guidelines. The State of conservation report does not supply plans, photographs or details of the scale of the two commercial malls other than acknowledging that they are 16 and 14 meters high, in contravention of the State Party’s own regulation. Without any supplementary information it is impossible to assess the impact on the Outstanding Universal Value (OUV) of the property. The report does not mention the underground car park beneath the Mall which, according to a letter to the Word Heritage Centre (reference http://highpeakspureearth.com/2013/ourlhasaisonthevergeofdestructionpleasesavelhasabywoeser/), required a drainage scheme which could have structural and water supply implications for the property; the apparent drying up of the Kyichu river gives cause for concern. The demolition of historic buildings also referred to are not mentioned in the report; the only demolition described is the demolition of modern and inappropriate office buildings. Road improvement schemes, undertaken apparently without any prior archaeological work (also illustrated in the reference) are also not described. The apparent scale and nature of the new developments, including tourist facilities and new commercial infrastructure, do give cause for concern but cannot be verified without a reactive monitoring mission. It is recommended that the Committee consider requesting the State Party to invite a reactive monitoring mission to the property to enable a formal assessment of the new developments and their potential impact on the OUV. The mission could also review the management system for the property, progress with the revision of the Conservation Master Plan and conservation plans for the three component parts of the property, and ways to harmonize these with the Lhasa Urban Development Plan as per Committee Decision 35 COM 7B.65. 7. Further requests the State Party to submit to the World Heritage Centre, by 1 February 2016, an updated report on the state of conservation of the property and the implementation of the above, for examination by the World Heritage Committee at its 40th session in 2016.